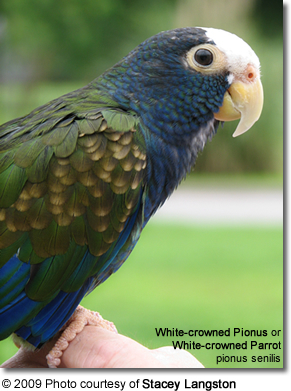 The Pionus parrot should always have access to a high-quality seed mix. A variety of fresh vegetables and fruits, such as berries and apples, should be offered every day. Synthetic supplements are never as good as the nutrients found in natural food. Still, there are some good quality pellet feeds out there and these are usually available at vets. Previously the general recommendation was to feed 80% pellets and 20% seeds, mixed fruits and vegetables. But I would say it is wiser to reverse this number, unless you really are unable or unwilling to provide natural foods. 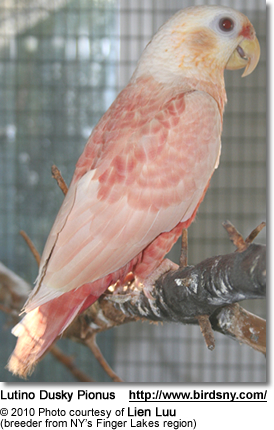 In this case, it is better to feed good quality pellets than putting birds on a seed-only diet. 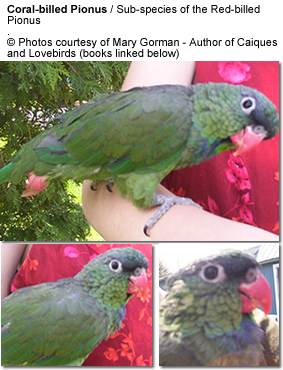 Breeders recommend SMALL-sized pellets as these birds tend to waste less of them. I personally prefer unprocessed food, as I am concerned about chemicals / additives in processed feeds. When pellets were originally introduced, these were recommended by vets as a more "more complete" diet as birds were no longer able to "pick and choose" their favorite seeds / nuts. However, over time problems have been associated with pellets, such as mycotoxins in the grain used to make those pellets; in addition to inferior ingredients (artificial supplements / additives) found in many of these pellet feeds. As is the case with most parrot species, their diet should include a variety of fresh fruits and vegetables daily to add nutrition and psychological enrichment. Their food intake should be monitored as overfeeding can lead to selective feeding and wasteful throwing of food. Pionus parrots should be fed little to no sunflower or safflower seeds. Vitamin supplements are not needed for birds that are eating a formulated or nutritionally complete diet. However, if the base diet is seed-based, a good avian supplement should be given to prevent deficiency diseases. Such supplements should be added to soft food items rather than adding them to the water, as this dilutes the vitamins and water-soluble vitamins break down rapidly. Also, water containing sweetened vitamins is a good growth medium for bacteria. On the other hand, supplements sprinkled over seeds are usually lost when the bird shells the seeds.